Many people visited sunny beaches on March 18, which is March 3 on the old lunar calendar, to hold an event called Hama-ori. Many children enjoyed clam digging on the beaches. 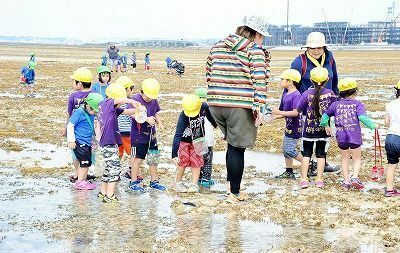 About 40 children, aged four to five, from Gajimaru nursery school in Mekaru, Naha City, visited and played at the beach in Urasoe. Putting sea water on hands and forehead, the children prayed for health before stepping in the water. Hama-ori is an annual event practiced in the Amami and Okinawa regions, when people visit beaches to dip feet and hands in sea water to purify and to pray for health.